Help us expand the list! Please email your course reviews to The Walking Golfer. On April 20th, I had the pleasure of playing 36 holes at Chambers Bay with Society member Mike Wagner and fellow golf architect buff and local sherpa Peter Herreid. It was an epic day of golf, in perfect conditions, on the course that will host the 2010 US Amateur and 2015 US Open. Nyk Pike and the team at Chambers Bay were fantastic hosts and the caddies were excellent. If you are fortunate enough to play Chambers Bay on a clear day, you will be greeted with a breathtaking vista that includes the Puget Sound, several islands, the Olympic Mountains in the distance, and a bird’s eye view of one of the few real links courses in North America. Chambers Bay meshes seamlessly with its surrounds, although it was completely manufactured with over 1.5 million cubic feet of earth moved. 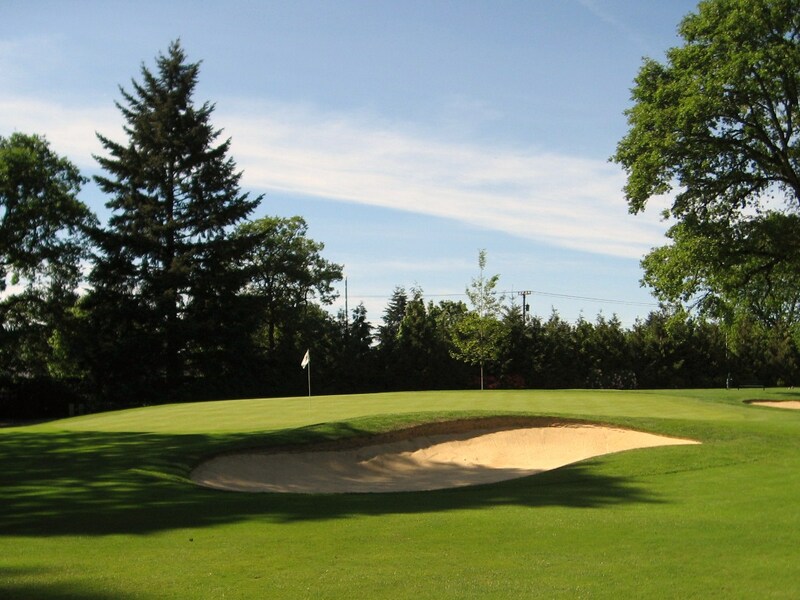 Prior to construction, the site was an old mine comprised of sand, gravel and rock that would provide an ideal foundation for the course and its many bunkers and waste areas. 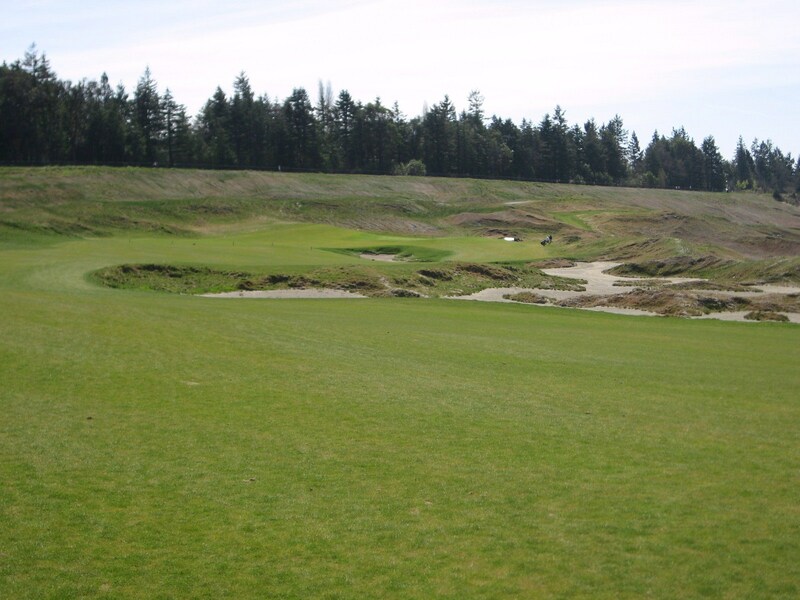 The raw and rustic look of Chambers Bay in its present form is the culmination of skillful earth moving and agronomy. 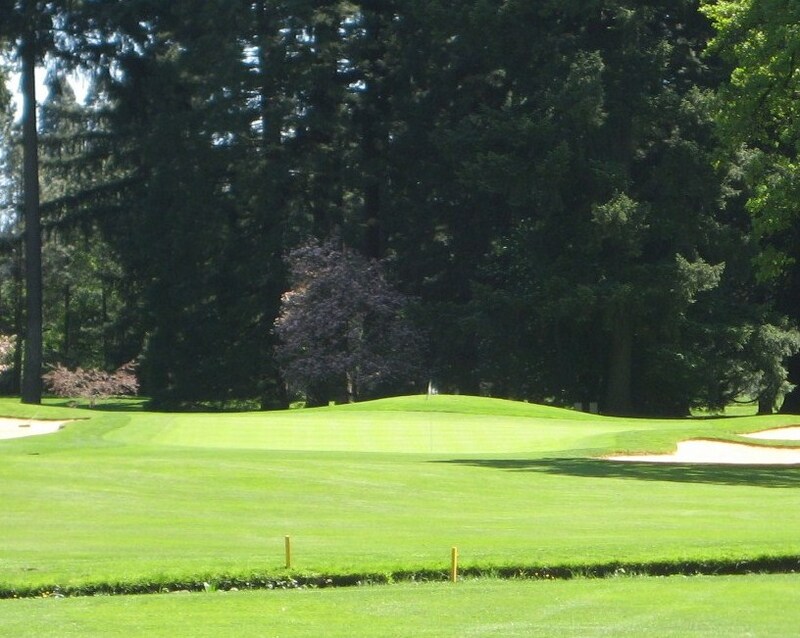 Robert Trent Jones II and Company was hired by Pierce County to design and build the course, and it was determined early on that it should be walking only. 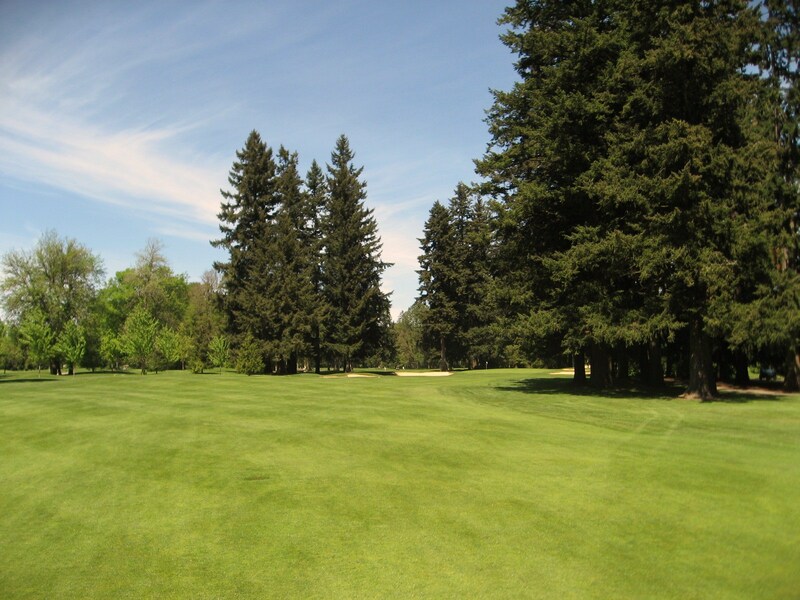 The decision to have a walking golf course was very difficult from an “industry trend,” standpoint, but ultimately it was the decision that made the entire project come together . . .
From a designer’s perspective, golf carts and more importantly golf cart paths have a severely negative impact on the design of a course. 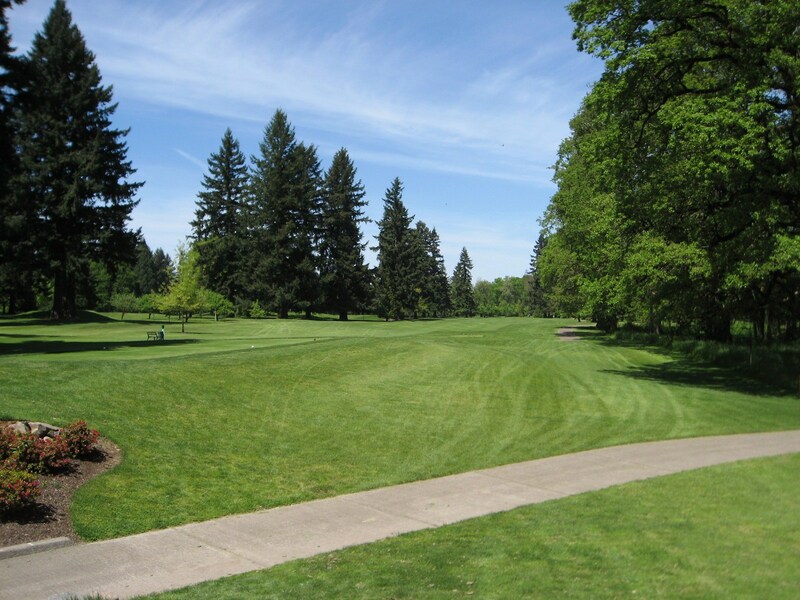 The paths often compromise the strategy or playability of a golf hole. 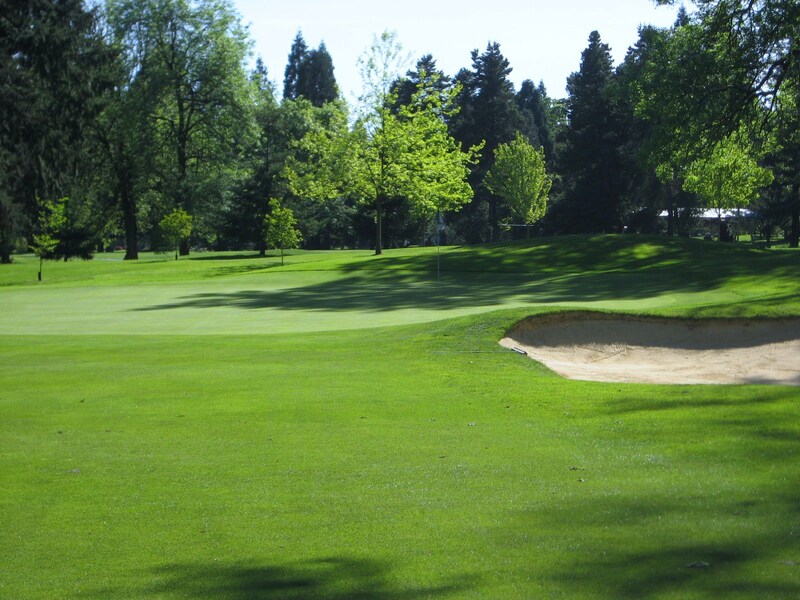 The most notable spot where a golf cart paths have an adverse affect on golf is in a valley setting. 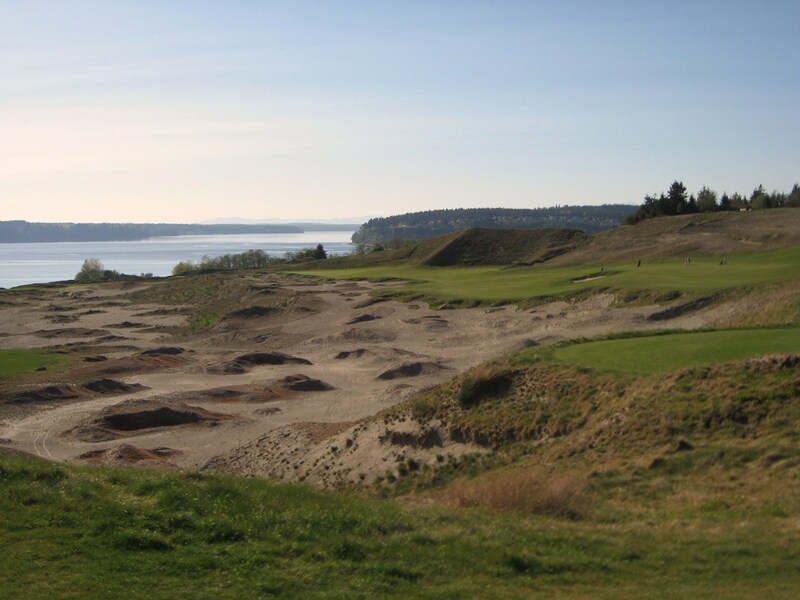 When we first walked the property for Chambers Bay, we taken back by the scale of the landforms, and excited to find a number of dynamic settings for golf holes and more importantly green complexes. To have dunes or hillsides on both sides of a golf hole is extremely rare and immensely exciting opportunity and has the potential to yield great golf holes. The dunes or hillsides, essentially become the walls of the hole, (and sometimes you can use those walls to bank your shots). Fitting a golf cart path in that setting not only disrupts that natural beauty, but compromises the strategic element of the hole. 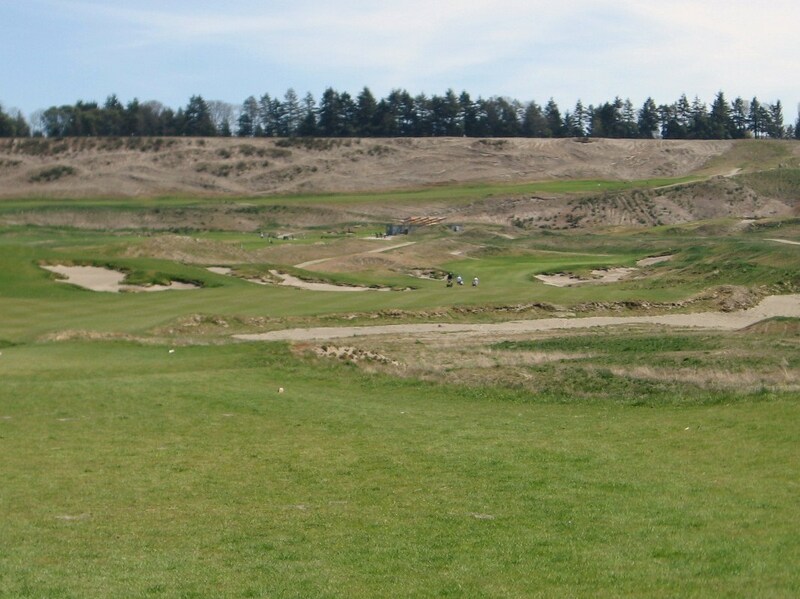 At Chambers Bay, eleven holes would have been severely affected by introducing golf cart paths. 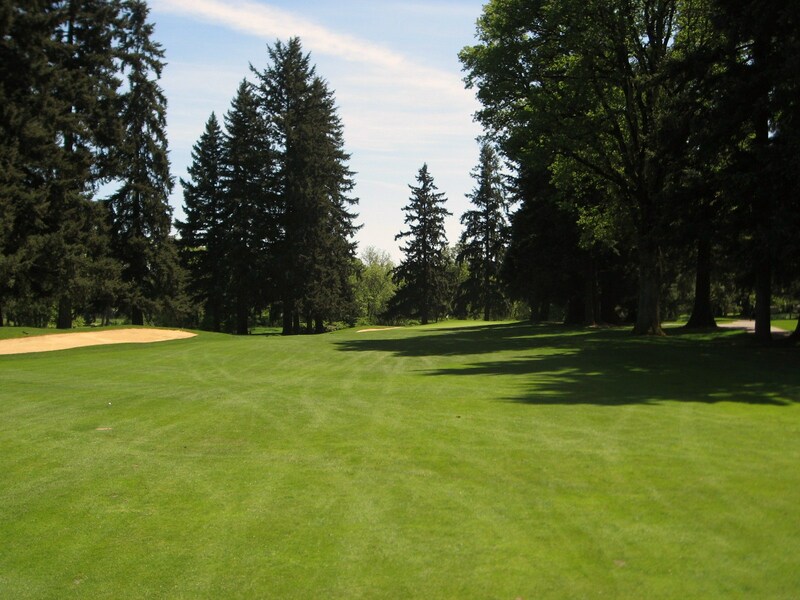 Most notably, the greensites for holes 1, 10, 12 and 14 never could have been utilized. One of the beauties of links golf is the firm and fast playing conditions . . . in the U.S. we play golf on carpet, while the Scots play on hardwood floors. Those “hardwood floors” allow players to hit the ball low, run it along the ground and utilize the contours of the fairways/greens to get their ball close to the hole. In order to achieve firm and fast playing conditions two things are needed: sandy soils and fescue/bent grasses. Without these grass types, the entire design of the golf course, especially the slopes, rolls, humps and bumps in the fairways and greens would be completely different. 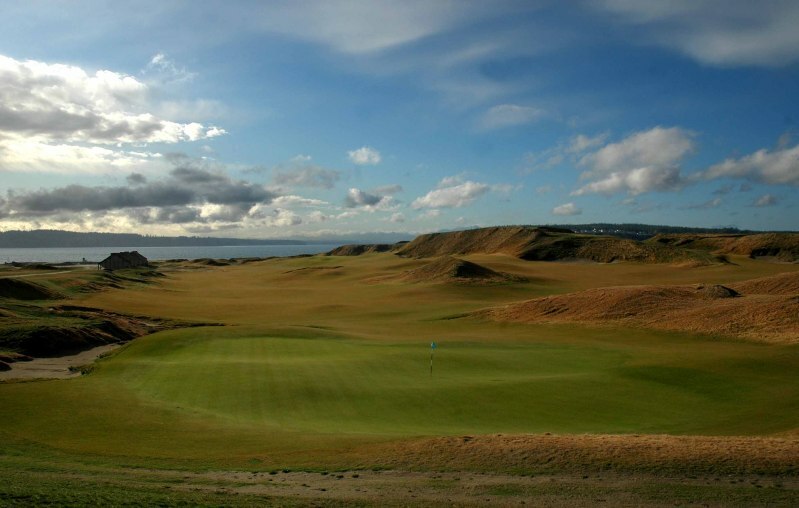 The fescue and bents grasses are the only grasses that provide the proper canvas for links golf. 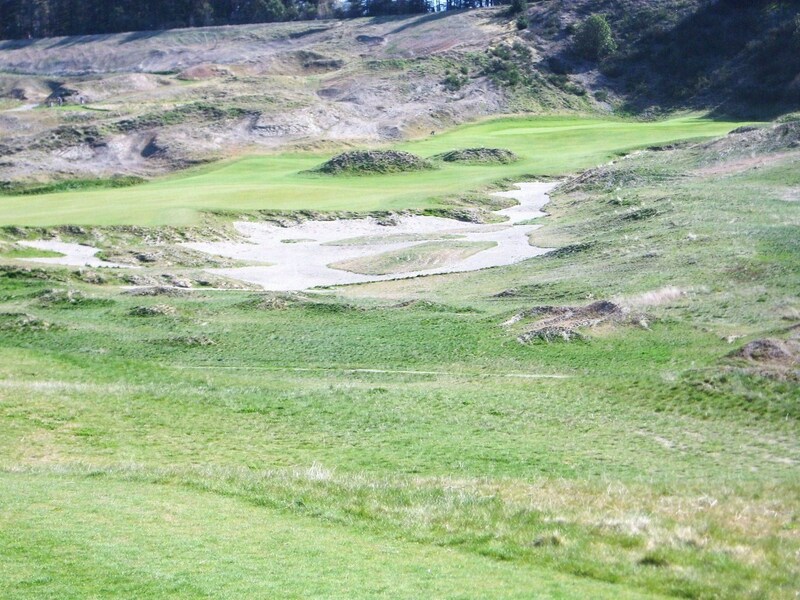 While these grasses thrive on sandy soils and in maritime climates, they are not as wear tolerant as some more common grasses to golf in the United States. 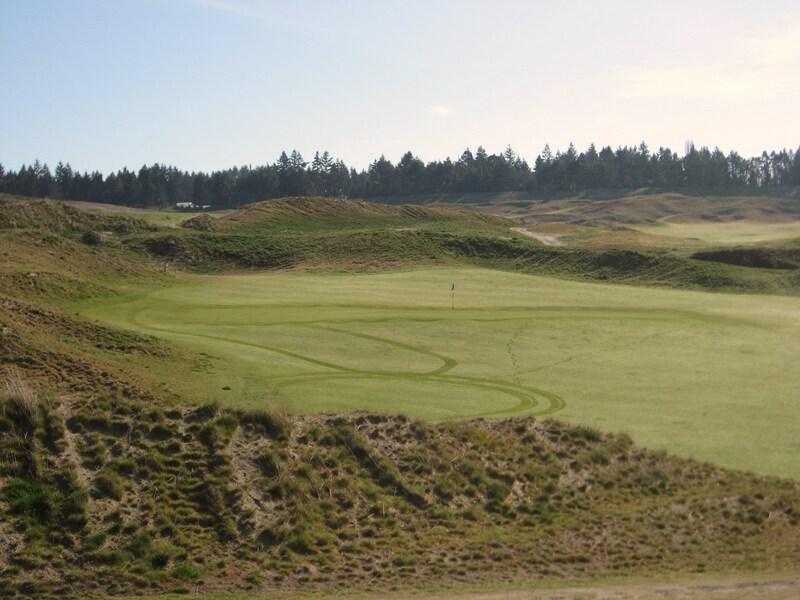 The wear and tear that golf carts place on the grasses would have killed the fescue and bent grasses utilized at Chambers Bay. RTJ II’s design team has turned this old sand and gravel mine into a venue that will be worthy of hosting the US Open in 2015. The links design has provided the USGA and team at Chambers Bay with a massive amount of flexibility in terms of course set up. One of the great benefits of a wide open links style golf course is the pliability of the land and routing. 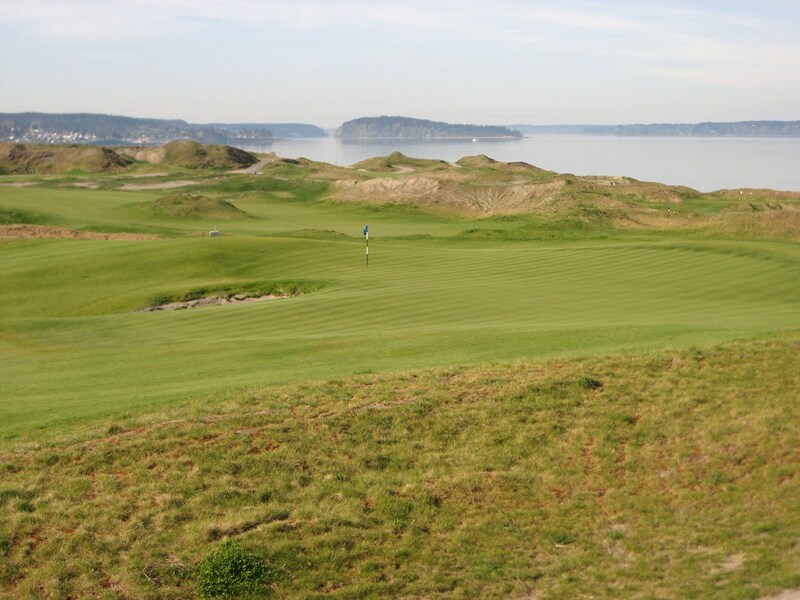 “Chambers Bay, for any links enthusiast, is the ultimate experience. 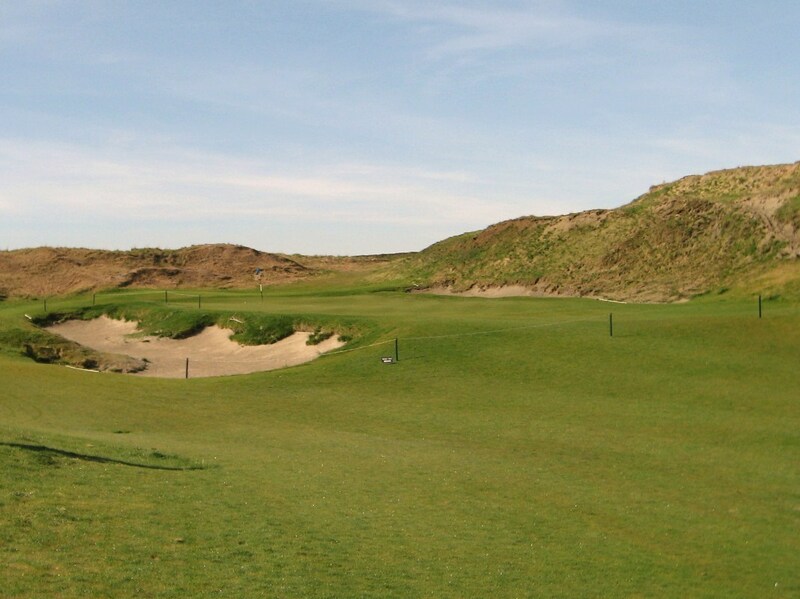 Players have the option of playing anywhere from 5200 to 7500 yards, making the linksland enjoyable for those of differing distance capabilites. 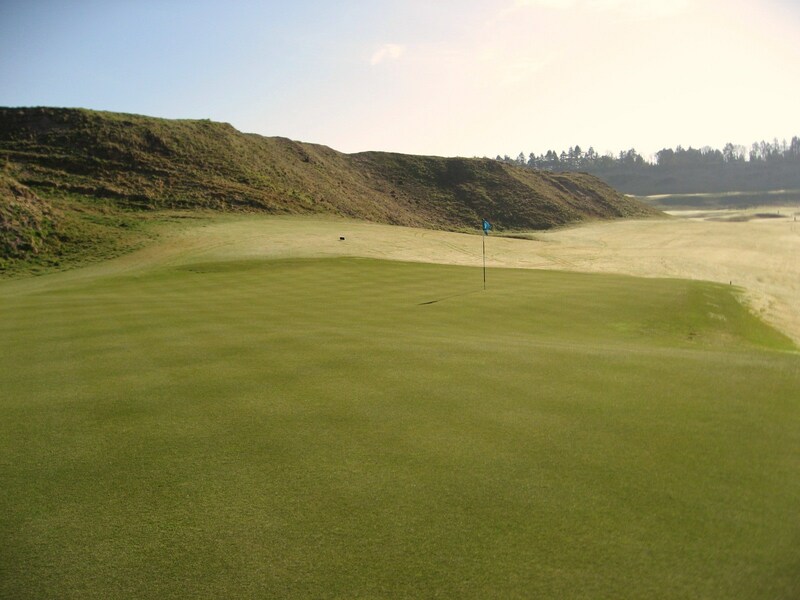 The green complexes, waste areas, and demanding bunkers will test every golfer, while the pure links style also gives players a chance to enter greens through rolling land features. Chambers Bay is as demanding as any golf course I’ve played, challenging the player on many risk/reward tee shots, depending on the tees and lines they choose. 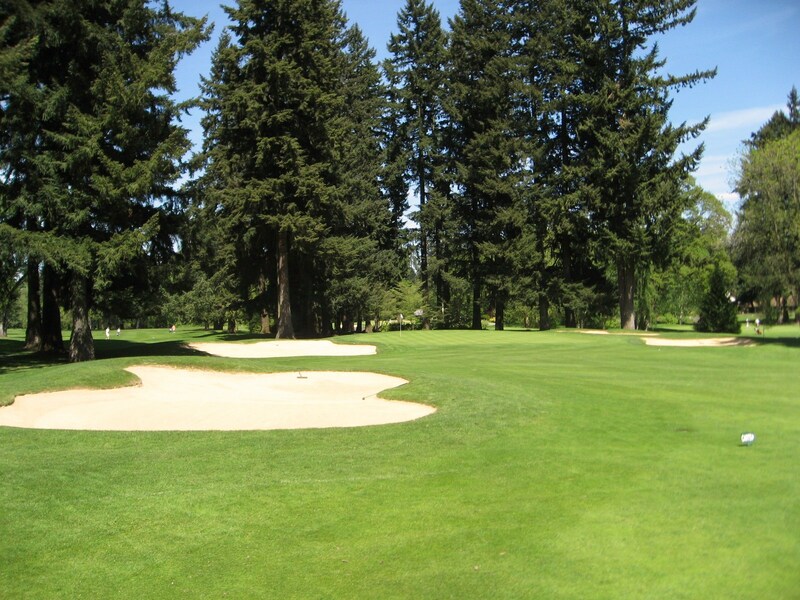 Certain holes require extreme precision for a close birdie chance, but always have a ground entrance option, setting the stage to test uncertain nerves. The views are breathtaking! The property is on Puget Sound and has an elevation change of approximately 500 feet, which provides stunning panoramic views. 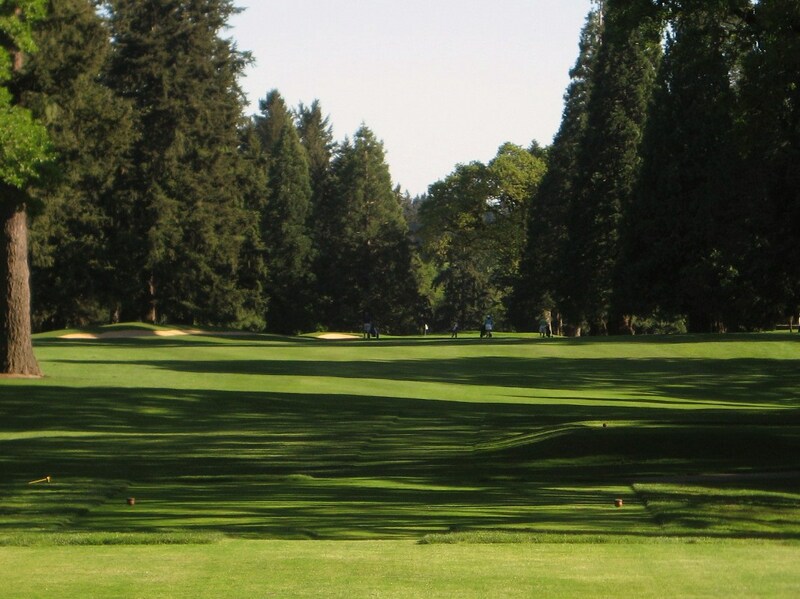 Very few courses in the world can provide the setting of Chambers Bay – Puget Sound, passenger trains, and a public access walking path meandering through the lower portion of the course. 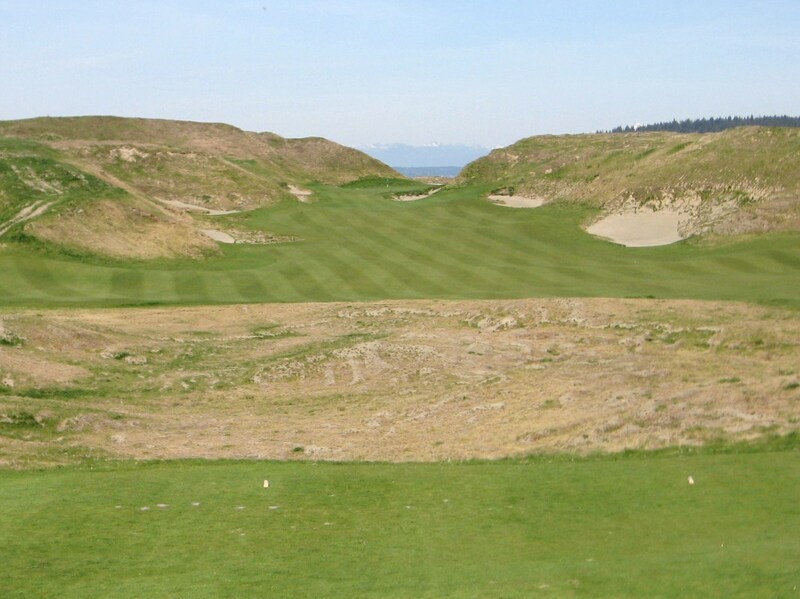 As a walking only course, Chambers Bay has been able to build green sites that are rarely seen in North America. 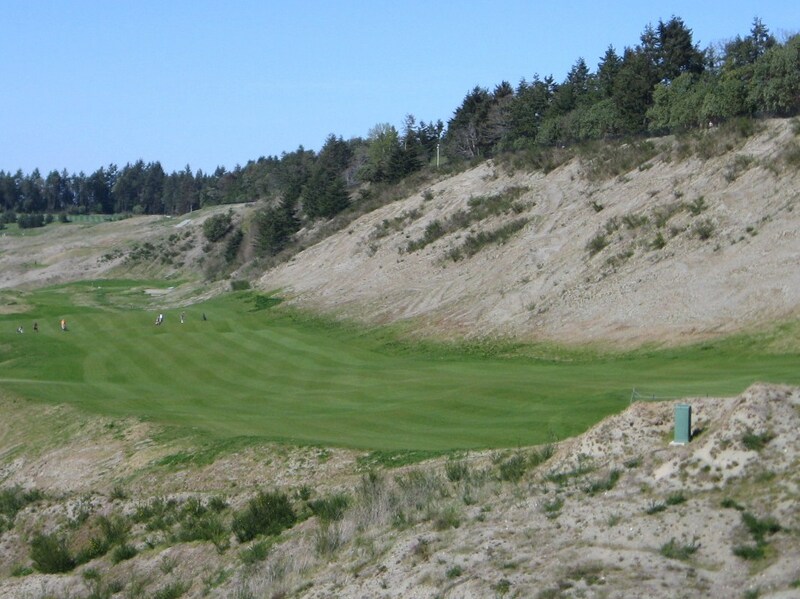 If you’ve played at any of the Bandon Resort courses, you’ll know what I mean – it has a very similar feel. Without cart paths, they have created approach shots that incorporate immense dunes and allow players to use slopes appropriately. 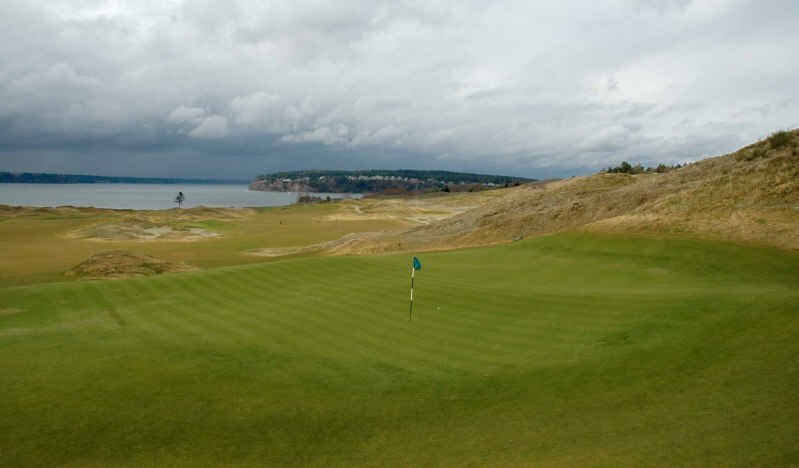 A great deal has been written about the fescue greens at Chambers Bay because several have been rebuilt and the speed, in general, is consistent but very slow. 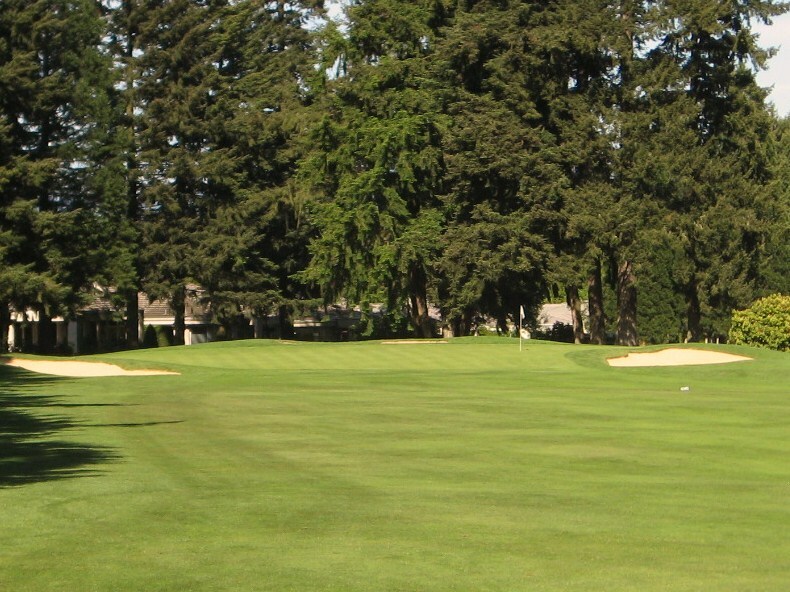 For any golfer who is used to putting on super fast country club greens, Chambers will be a shock and it will take several holes to adjust to the speed. However, I do not believe the greens negatively impact the experience or would be out of place on many a links. 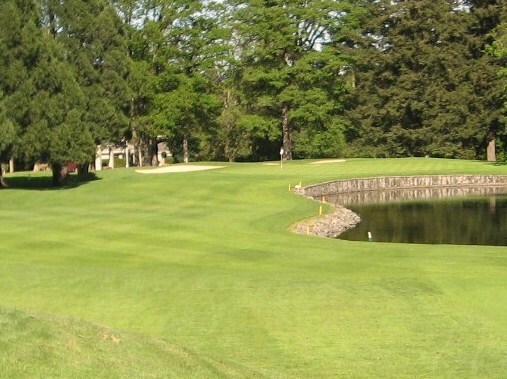 I have played quite a few courses in Ireland that had slow greens which required an adjustment in putting technique. While green speed at Chambers Bay will likely pick up over time, which will help most golfers, they are currently an enjoyable challenge. Just putt them with an open mind and be creative. 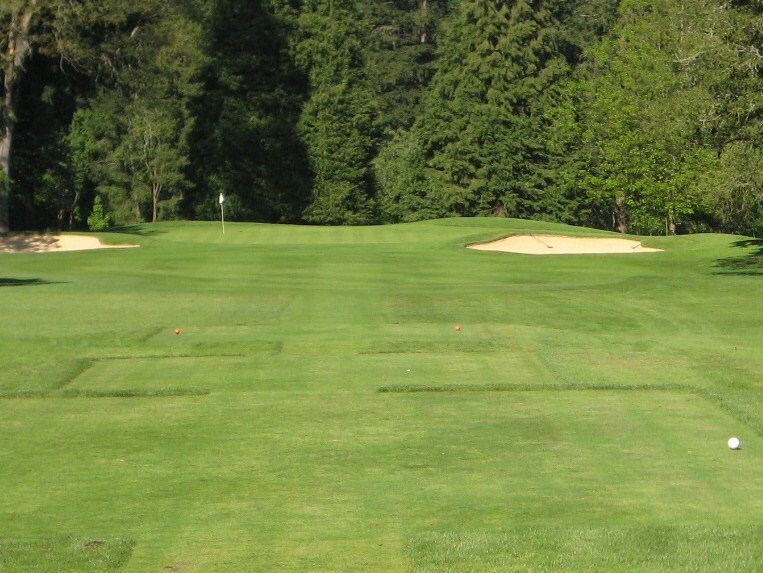 One of the benefits of slower greens is that the golfer can play an attacking ground game without worrying about bump and runs rolling off the green into waiting bunkers and waste areas. 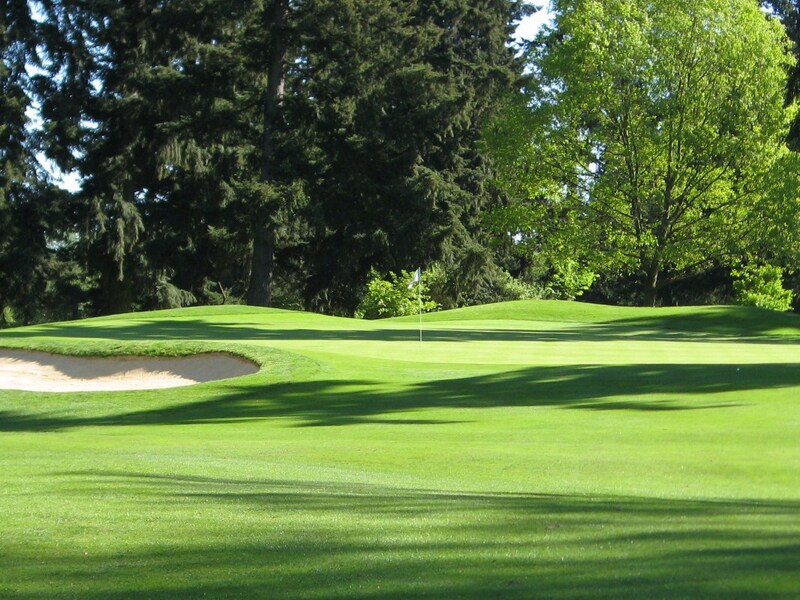 Aggressive golf can be a lot of fun and the ground game is a vital element in scoring at Chambers Bay. In terms of Walkability, Chambers Bay rates a 2.75 out of 4 based on responses from the public for our Walkability Ratings. 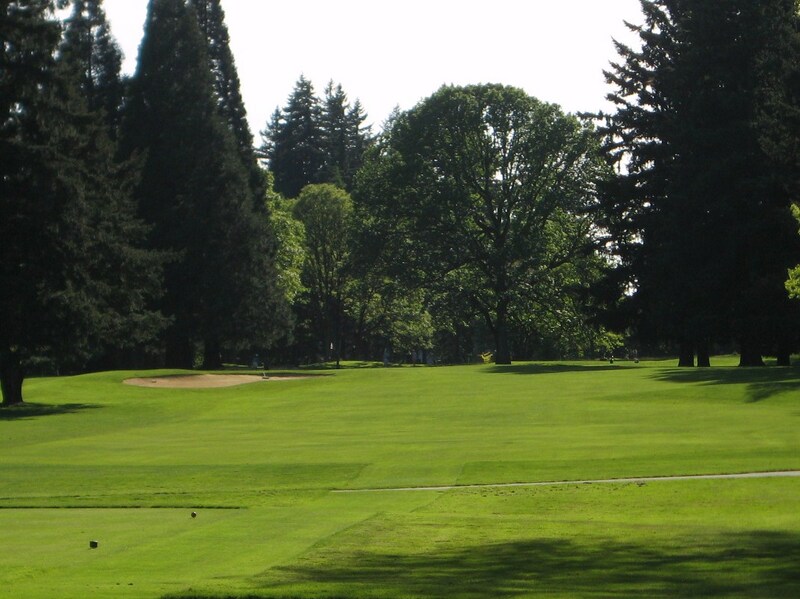 There is a couple hundred feet of elevation change on the course and there are a few long green to tee transfers, but the course’s dedication to providing a spectacular walking only environment makes the trek an absolute pleasure. For golfers who are not in good physical condition, I would suggest a caddy and some cardio work before you play the course to get ready for it. 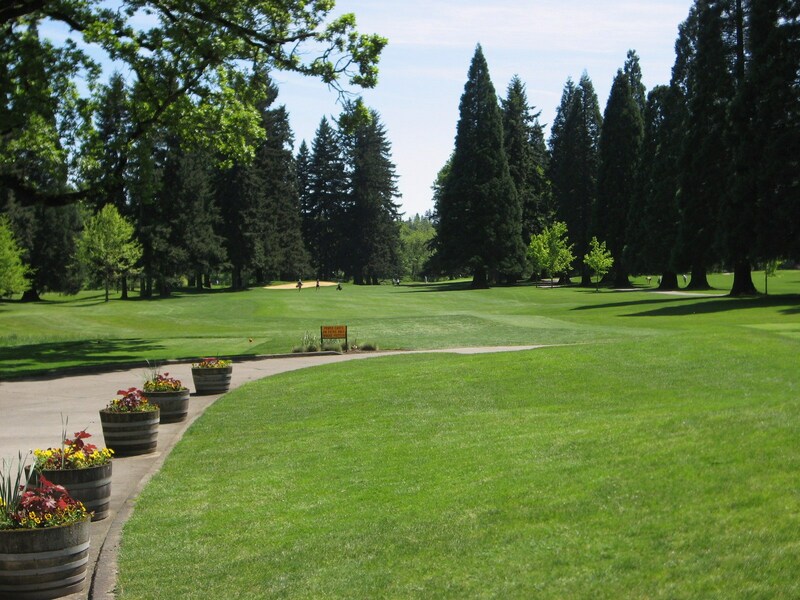 The walk at Chambers may not be “easy’ for all golfers, but it is definitely “manageable”. I pushed my Clicgear 2.0 cart for 36 and was ready for another 9 when we finished. Chambers Bay is definitely a great walking golf course and the design team have done a phenomenal job of integrating a lot of the elevation changes into the field of play, not the green to tee transfers. 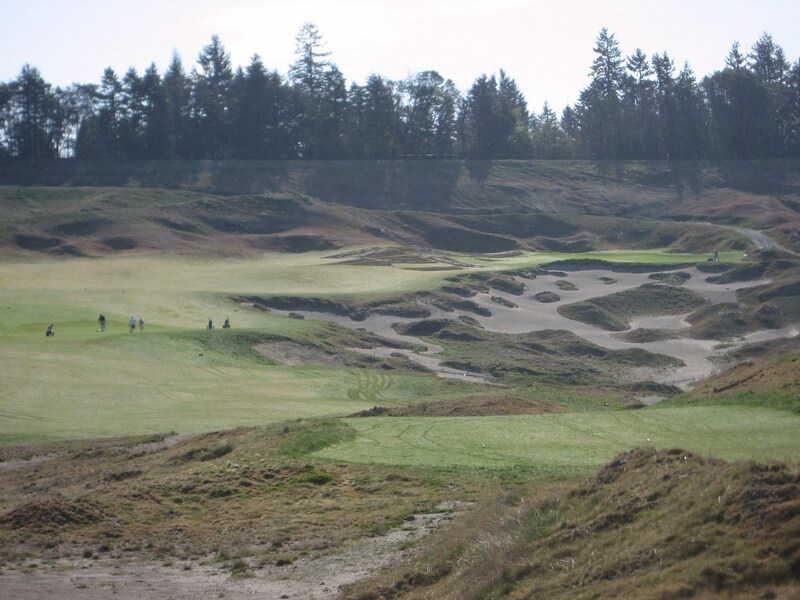 Chambers Bay receives 3.75 our of 4 for Architecture and Aesthetics. 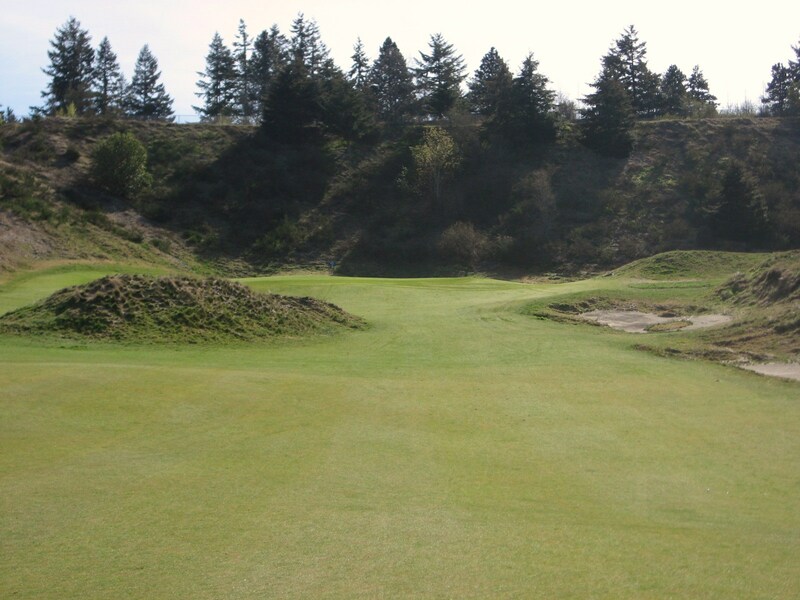 Aside from Bandon Dunes Golf Resort, Cypress Point and Pebble Beach, there are probably few settings on the west coast that could challenge Chambers Bay for honors as the most spectacular golfing site. 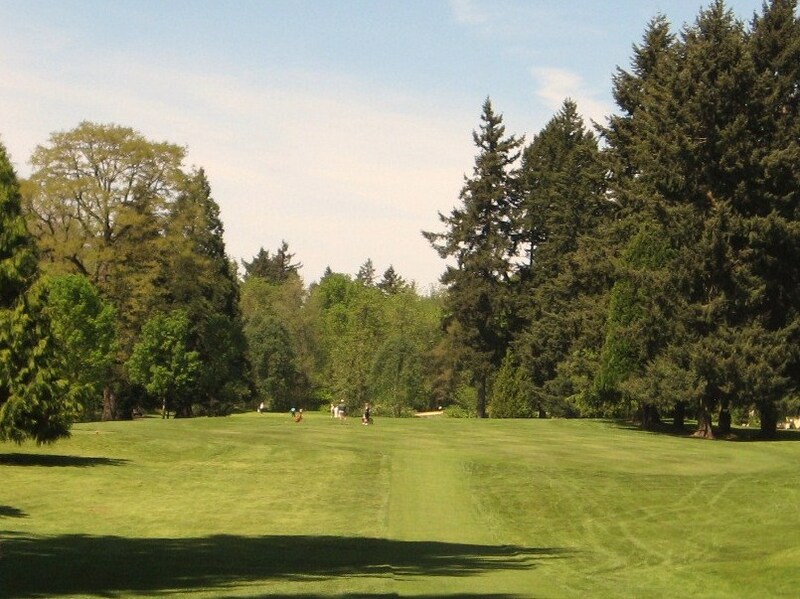 As mentioned, Puget Sound and the Olympic Mountains provide a stunning back drop for the course which is located in a massive 250 acre amphitheatre that was once a mine. There are elevation changes on tee shots of over a hundred feet and huge dunes line many holes and cast spectacular shadows across the course in the afternoon. The routing is excellent as well. Please read the hole by hole description below for more detail, but it is safe to say that RTJ II and Company have created eighteen good to exceptional holes on the property with a balance of distance, risk reward and variety. 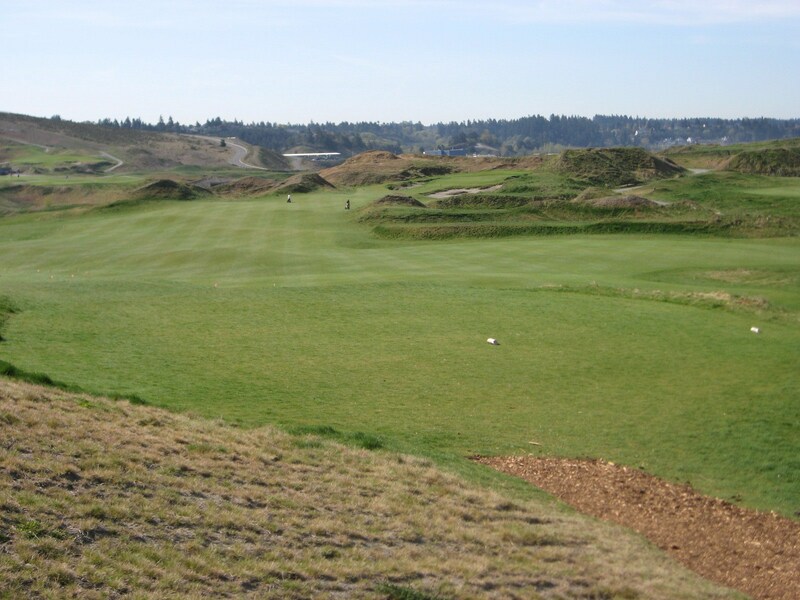 Chambers Bay also gets full marks, 2 out of 2, for Playability and Strategy. 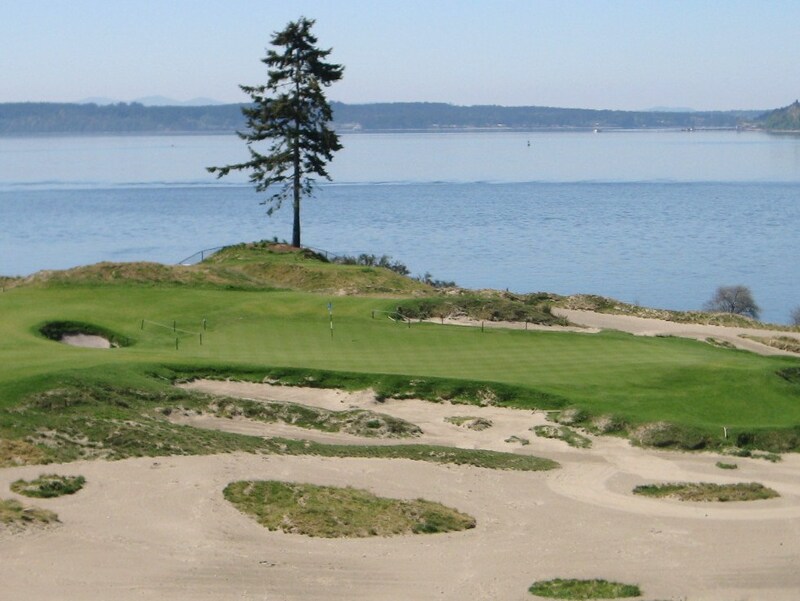 Like few other courses I have seen, Chambers Bay provides excellent strategic challenge for every level of golfer. 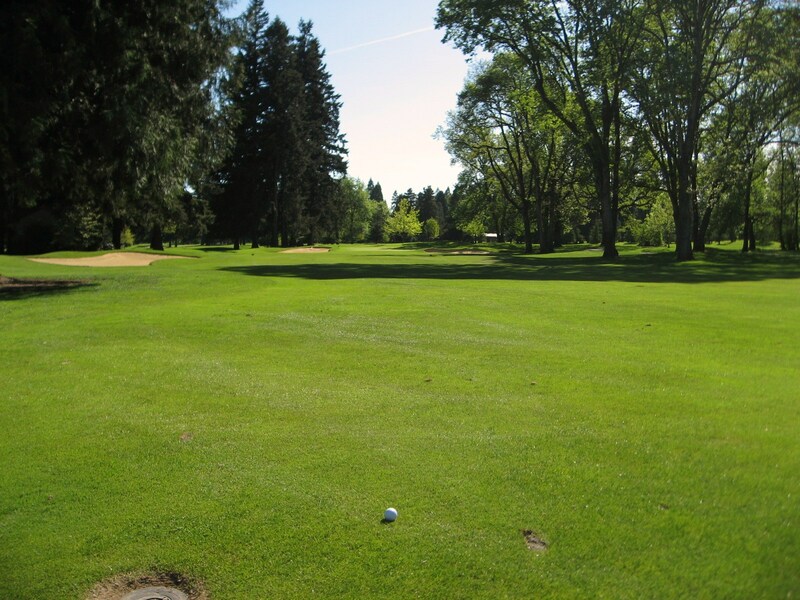 For example, several “cape-like” tee shots ask the golfer how much risk they are willing to take with their drive to minimize distance on the approach. The seventh and fourteenth are a wonderful illustration of an architect challenging both the tiger golfer and the short hitter with aggressive and safer options. The fairways are wide as befits a links course, although “rough lines” are being implemented per the USGAs request for the 2010 US Amateur. It is very difficult to lose a ball on most holes, but it is also tough to score, which provides a nice balance. The ability to place a tee shot is vital for the golfer to challenge the course, but the tricky waste areas and mounds can be played away from by the higher handicapper looking to play bogey golf. 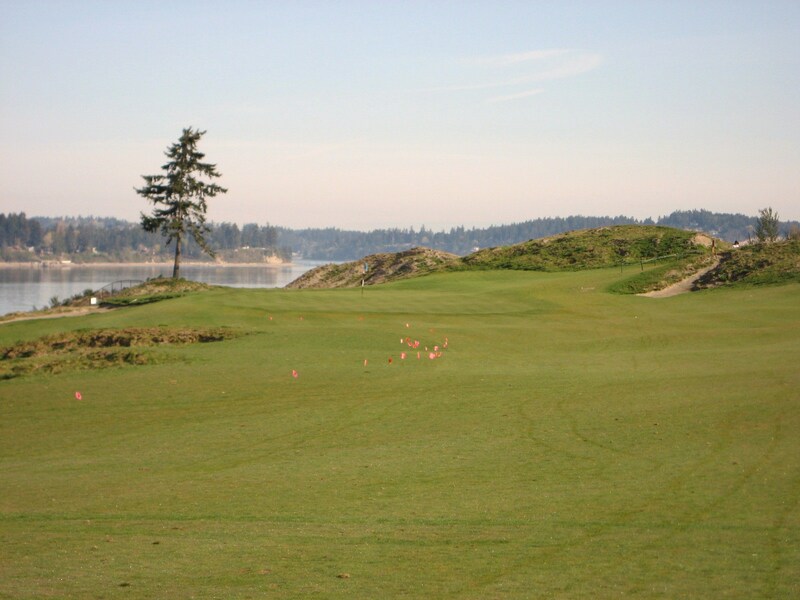 Thus, overall, Chambers Bay receives a 9 out of 10 from The Walking Golfer and I would encourage any passionate walking golfer to go out of their way to play the course if they are ever in the area. 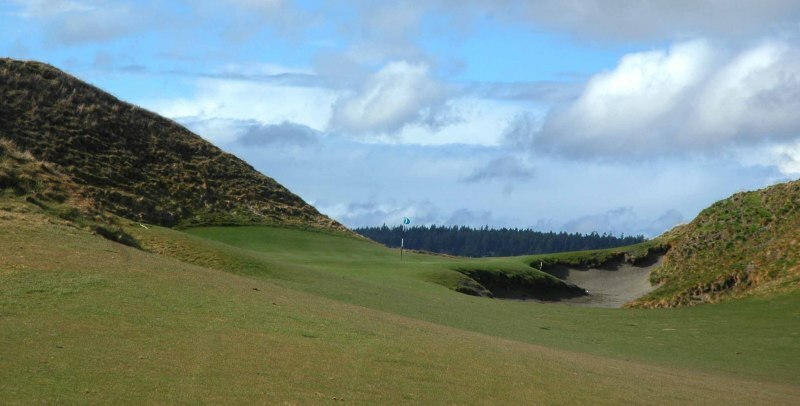 There are five sets of tees at Chambers Bay so the longest and shortest are listed. The first at Chambers Bay is the toughest opening hole I have ever seen. This uphill Par 4 will play like a Par 5 for most golfers. The first and eighteenth fairways are combined, with mounds and bunkers breaking up the flow. 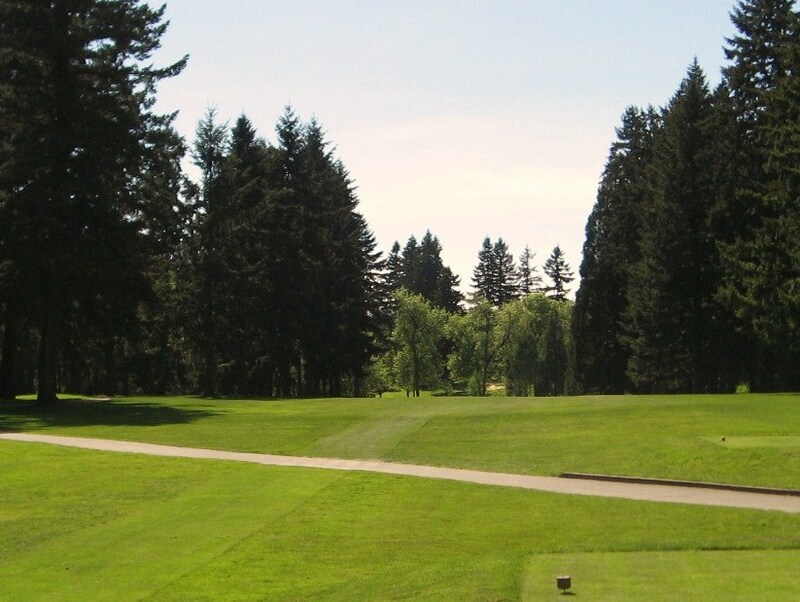 A solid drive will leave about two hundred yards, uphill, to a green with large mounds on the right and a steep drop to the left. 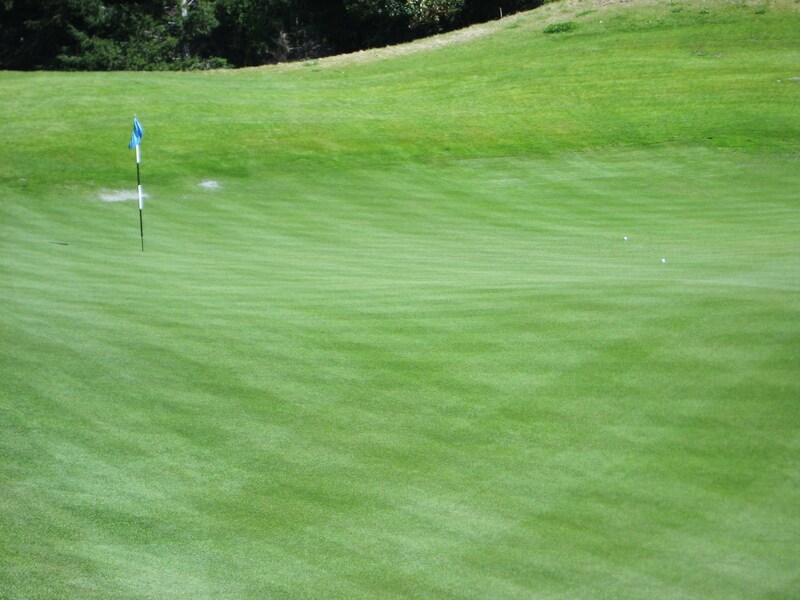 A large undulating putting surface awaits the well placed approach. The 1st Green at Chambers Bay from behind looking back towards the tee. Photo by Rob Rigg. The second calls for a well placed drive either short or left of a large waste area. This will leave a short to mid iron to a green with a nice side board on the right but trouble left. A big miss to either side will probably lead to a bunker shot, while short is safe. The flags in the picture below show where the USGA is planning on growing in the rough for the 2010 US Amateur. The third is a fairly short par 3 with a front right to back left sloping green. There is room on the right to miss, but short and left will lead to a nasty recovery from the blown out waste area. A back left pin, as shown below, will test the nerves of even the best golfer. 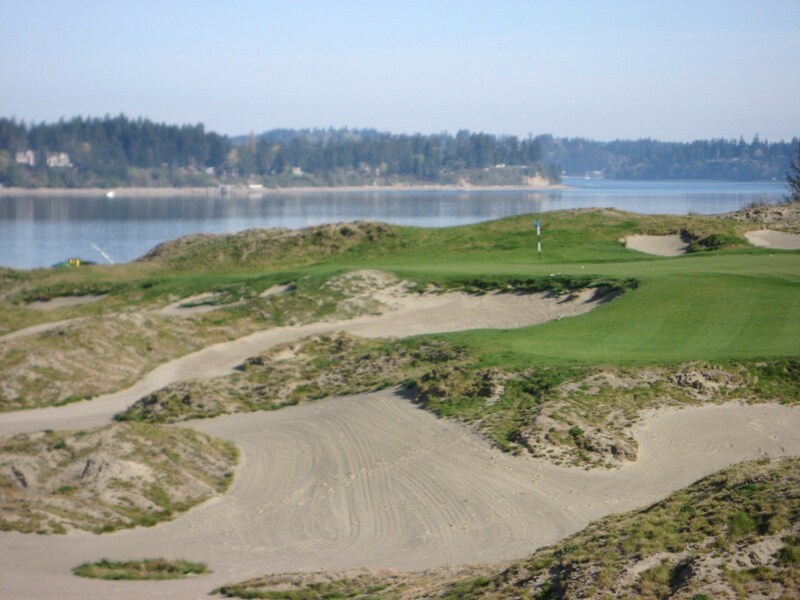 The Par #3 3rd at Chambers Bay. Photo by Rob Rigg. After a fairly long uphill green to tee transfer, the golfer is looking out at what may be one of the most daunting three shotters in the world. A gnarly waste area runs the length of this long hole and the green will only accept a well placed third. It is likely that golfers have spent many a shot trying to escape the waste area in front of the green. Currently, the 4th green is out of play so the hole has been turned into a drivable Par 4. The wise play is likely a three wood off the tee to the left side of a wide fairway and then a delicate chip onto the green that sits in a punchbowl. From the temporary 4th green the golfer descends, leaves his bag, grabs his driver, and hikes up to the 5th tee where a spectacular view awaits. There is a waste area running up the right side and bunkers to the left, in the distance, a wide fairway welcomes a tee shot that seems to hang in the air forever. The mid-iron approach is uphill to a very interesting green that is protected by a small bunker that seems to pay homage to the road hole at St Andrews. There is an alternate green which is rarely in play that can be used on the 5th to create a short risk/reward hole. The 5th is one of the most spectacular and challenging holes on the property, and starts a wonderful string of three Par 4s. 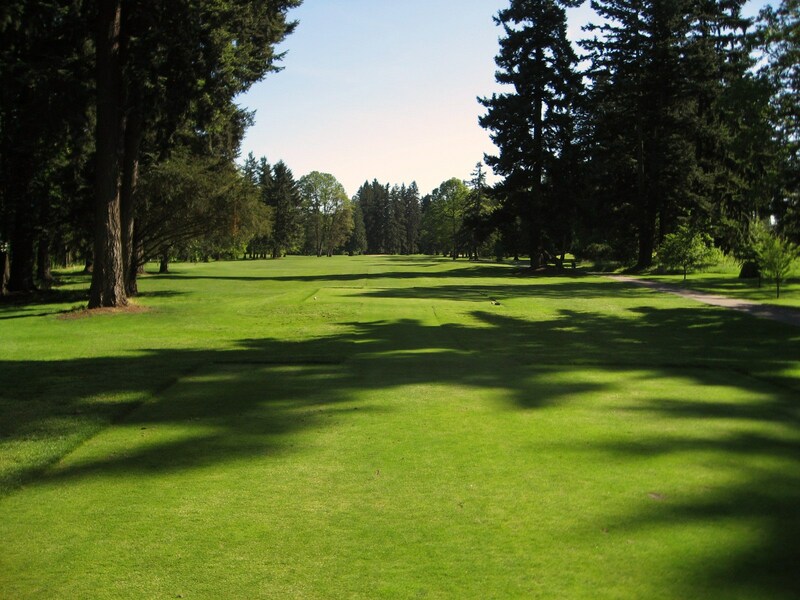 A large fairway awaits the golfer off the tee, but often the best line is fairly tight to the mounding on the right. The front of the green is well protected by a steep slope that will beat back weak approaches. Bunkers left and right put a premium on accuracy. A miss long will leave a delicate but manageable chip or putt back onto the green. The trio of fine two shotters is completed by the all world seventh. The golfer is called upon to bite off as much as he can chew on this epic drive that must carry a massive waste bunker. If the tee shot on the seventh cannot get your heart-pumping then you may not be alive. 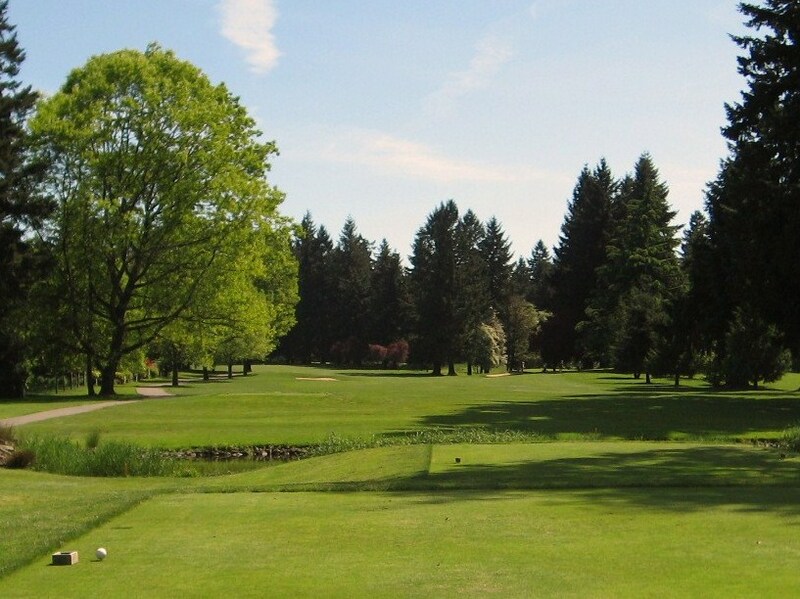 There is nothing more satisfying than taking it at the left side of the first mound and making the fairway. The daunting approach is a sobering moment for the golfer who just smashed a drive over the waste area. An optimal second will carry the false front and finish at the back of the green. Anything short or landing on the false front will roll back by the mound. At least two extra clubs are needed to manage the elevation change which means that even a good drive will often lead to a mid or long iron approach. As pictured below, there is a nice side-board on the left side of the green, and the back is safe as well. The spine at the right of the picture segments the green. The false front looks like a cliff, which it is, and the mounds in the picture above are now lurking in the distance. The 7th Green at Chambers Bay. Photo courtesy of Scott Weersing. Photos for personal use only. The eighth is a long and narrow three shotter with a rumpled fairway that runs on a ledge across the top of the property. An embankment of dirt runs along the hole to the left and there is a steep drop off to the right. Neither the tee shot, nor the second are for the faint of heart. 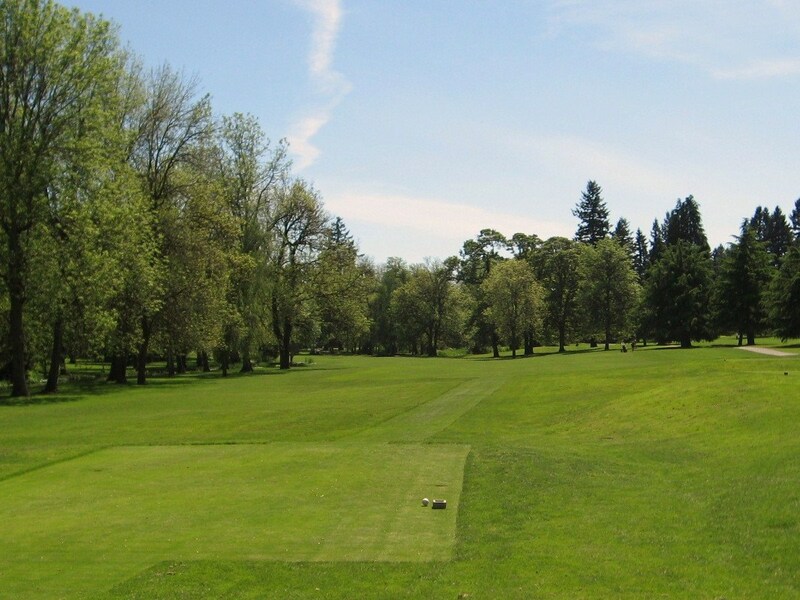 The short approach is to an elevated green with a kick board on the left side. 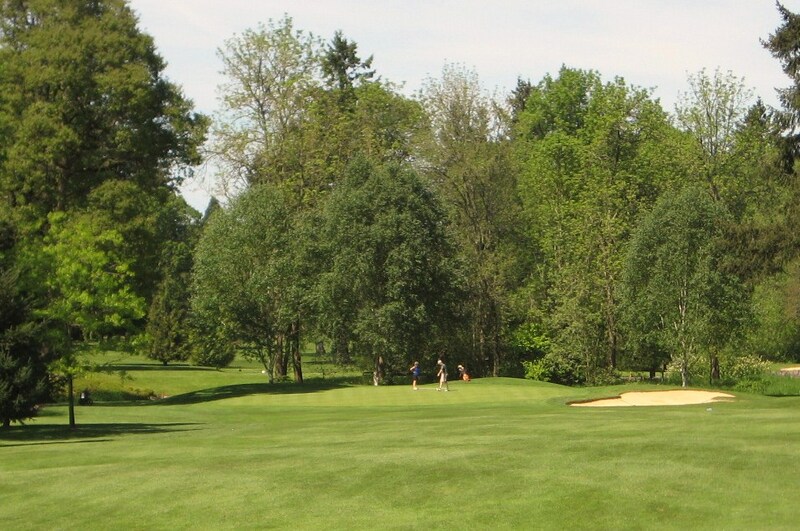 The golfers below are hitting towards the green which can be partially seen on the right side of the picture. The one shot ninth involves a severely elevated tee shot to the green below. The Olympic mountains glow in the distance on a sunny day, and the golfer has a wonderful view of the entire course from the tee. This hole is a ton of fun. Depending on the wind it can play a couple of clubs shorter or longer than normal. Short and right is a bad miss, while the left side provides a nice bank that will kick the tee shot onto the multi-tiered green. The back nine starts off with a classic links hole that looks like it was transplanted from the Irish coast. 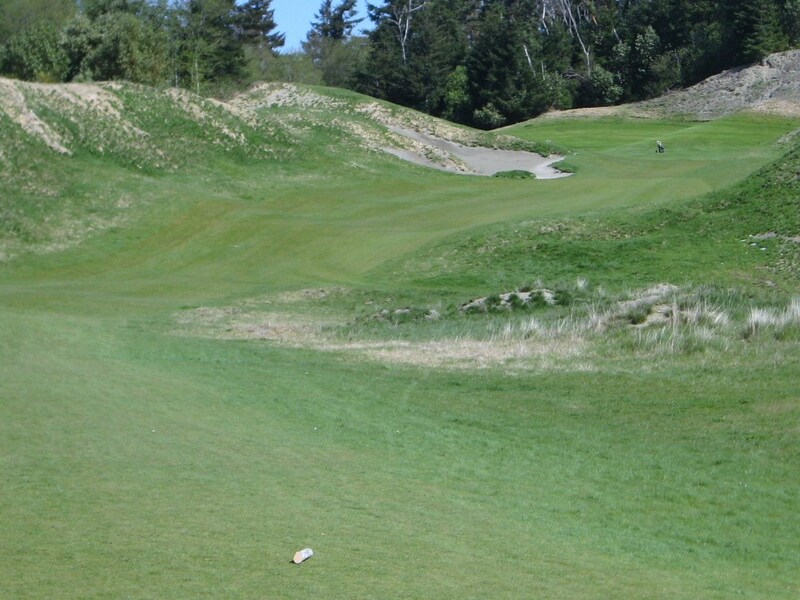 Towering dunes frame the tricky risk/reward drive that can be laid up short of the bunkers, which leaves a long approach, or farther up the bottle neck, which leaves a short iron. The forward tees could be used in the US Amateur or US Open to create a 320 yard driveable Par 4 with serious consequences for a miss. 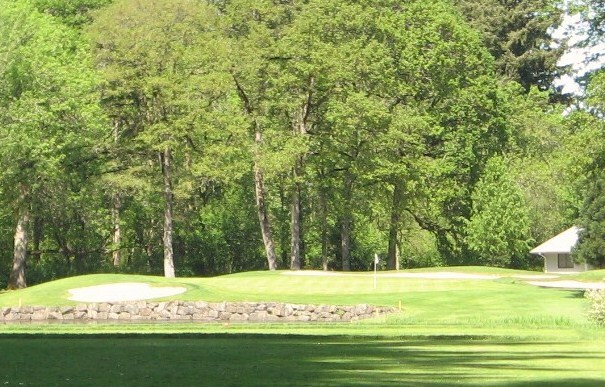 The challenging green complex is protected by the deep front right bunker that can be seen from the tee and dominates the golfer’s vision on the approach. Another bunker lurks on the left side, while a nice back board has been laid across the dune a little farther back. Although this is a relatively short hole, par is a great score. 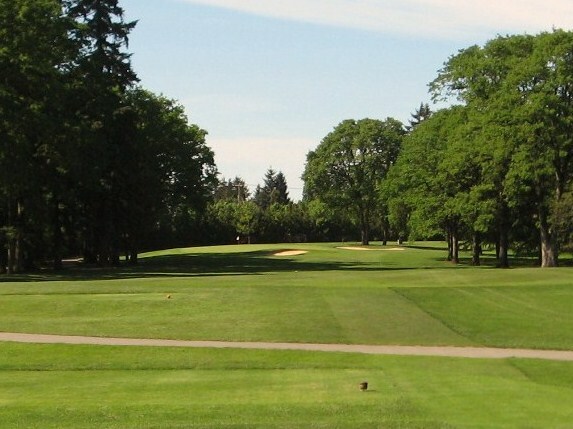 The 10th hole green complex at Chambers. Photo courtesy of Scott Weersing. Photos for personal use only. The 11th is a mammoth two shotter from the tips that consists of an interesting drive over a knoll in the middle of the fairway. The approach is to an elevated green that is built on a shelf with a bank to the right side and a steep drop to the left. 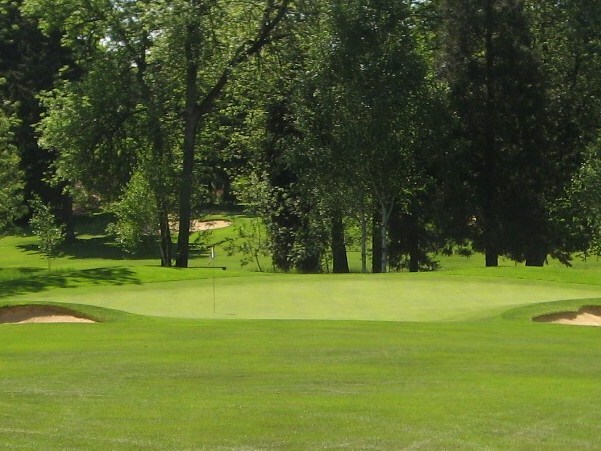 Many golfers will miss short or left and face a tricky chip shot onto the multi-tiered green. 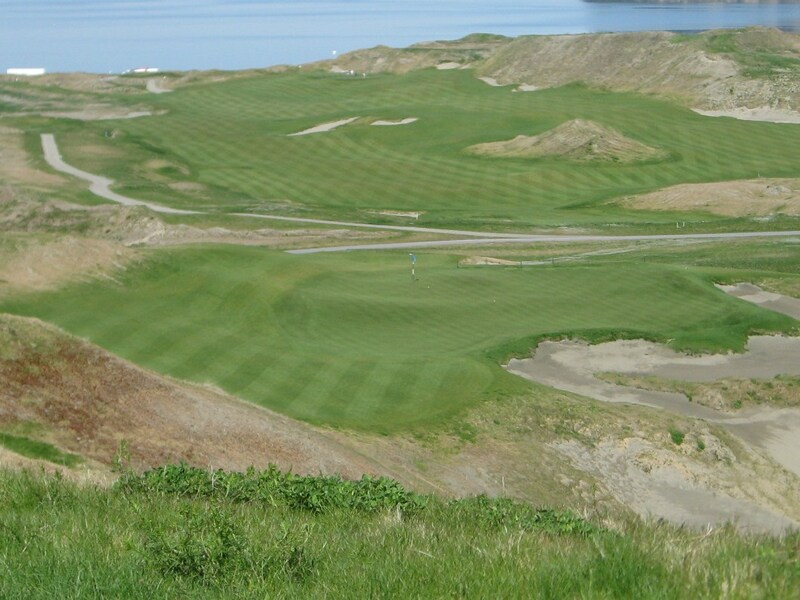 The great Par 4s at Chambers Bay just keep on coming, although number twelve is more like a Par 3 1/2. The golfer faces an uphill drive that needs to carry the serpentine fairway and a large blow out bunker to reach the green in one. A draw from the tee is the optimal shot and will often get a great kick onto the putting surface. The tee shot at #12 Chambers Bay. Photo by Rob Rigg. 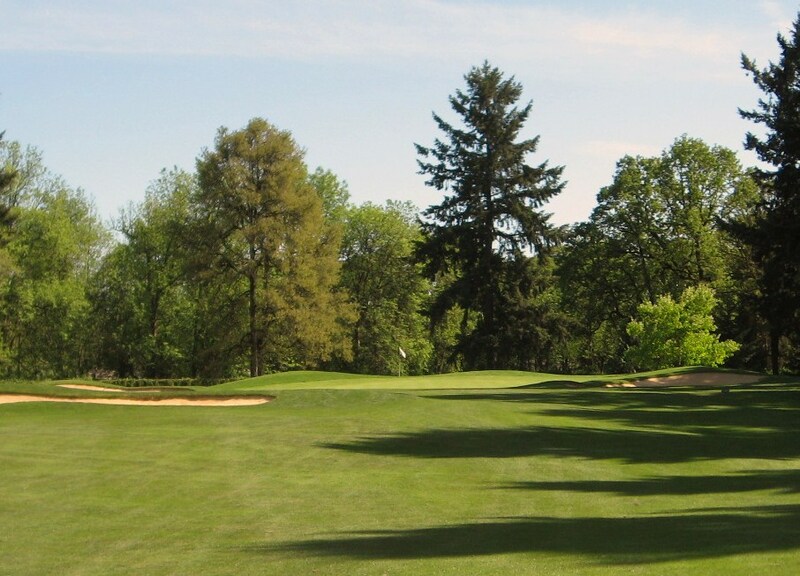 The large and undulating green stretches 58 yards from front to back so any drive to a back pin placement that gets stuck on the front can leave a putt of well over 100 feet. Two well struck drives are pictured below, unfortunately neither dropped for an eagle, there is nothing easy about this green and it provides a solid defense of par. The thirteenth is a solid three shotter that has ample room of the tee, although hugging the dune on the right side will provide a shot at the green in two. A miss right will result in a brutal recovery from the dunes, while a safe play to the left will make the green unreachable. 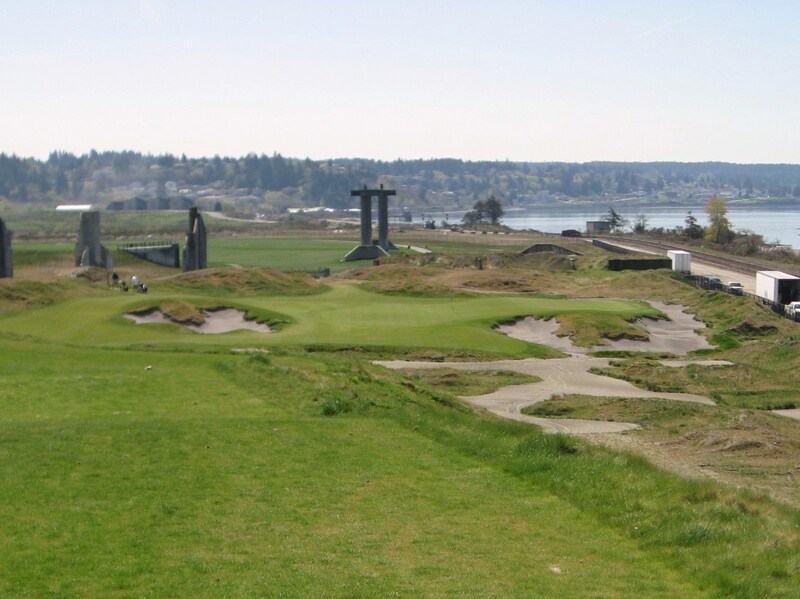 As if often the case at Chambers Bay, the architect is playing mind games with the golfer. 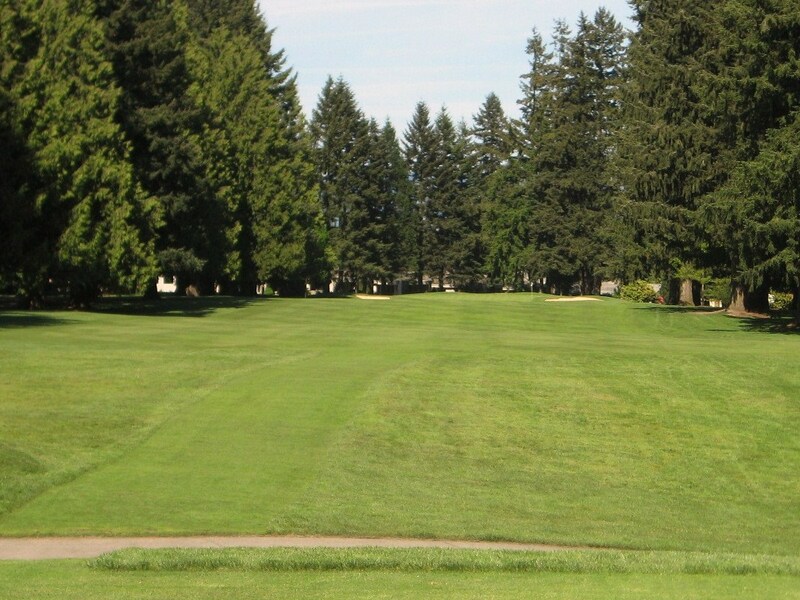 “Position A” will leave the approach pictured above, which must traverse a 160 yard long waste area and a gaping 35 yard bunker in the hopes of running up onto the green. A safe approach to the left leaves a fairly straight-forward chip or bump and run up the left side to a slightly pushed up green. This is a solid hole that will give up the occassional eagle and earn its fair share of bogeys. The tee shot on fourteen is the best on the course, it is truly spectacular, challenging and exhilarating. From the back tees, a well struck drive drops over a hundred feet as it rockets across a huge waste area to the fairway benched between against towering mounds. 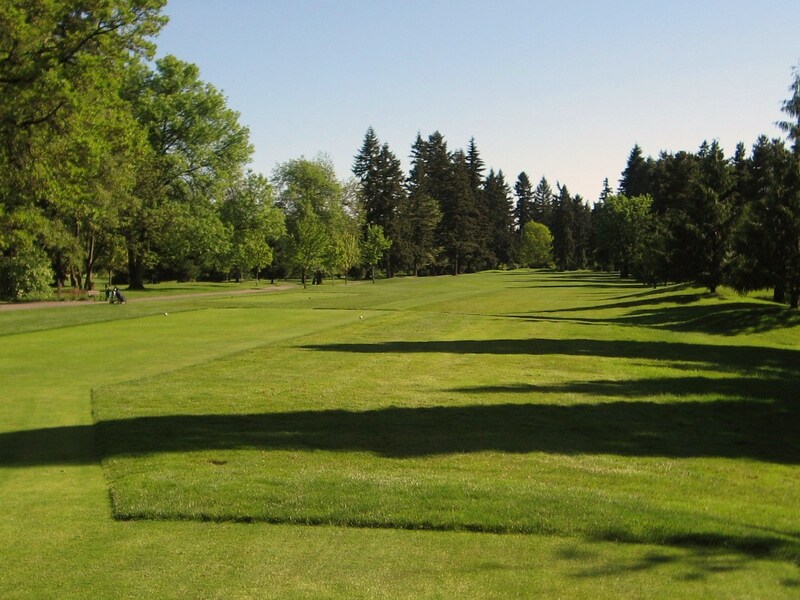 Even from the middle tees, as pictured below, the drive is heart pounding yet well suited to the golfer who can draw the ball. The rumpled fairway is a work of art and the lone bunker in the middle of the fairway is a monumental distraction that gobbles up many a well struck drive. The optimal tee shot will land just over or to the left of the bunker and get a turbo boost towards the green which adds another thirty yards to the drive. The putting surface is protected to the left by bunkers, but there is plenty of room on the right to miss. 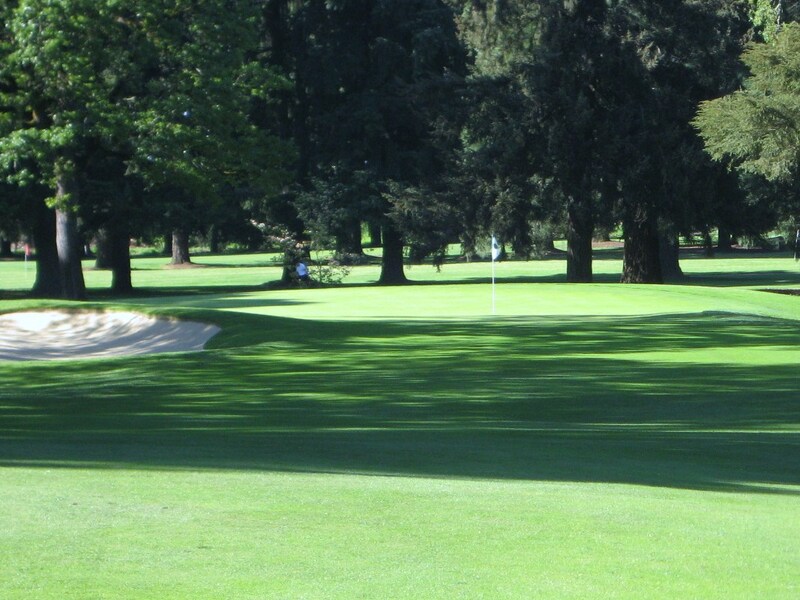 Short grass around the green provides a wonderful option to putt to the pin. Par is not out of reach on this hole, but it will feel like a good score. The 14th from the middle tee at Chambers Bay. Photo by Rob Rigg. The architect uses the lone fir at Chambers Bay to great effect on many holes, none better than the post card worthy fifteenth. This short one shotter is downhill and across a waste area to the green. It is probably the easiest hole on the course, but when the wind picks up it can be tough to judge distance and there is danger lurking around the hole. Long is probably the safest bailout as there is a backboard that should send a tee shot back onto the green. More noteworthy for its looks than its difficulty, there is many a course that could only dream of having something like it. 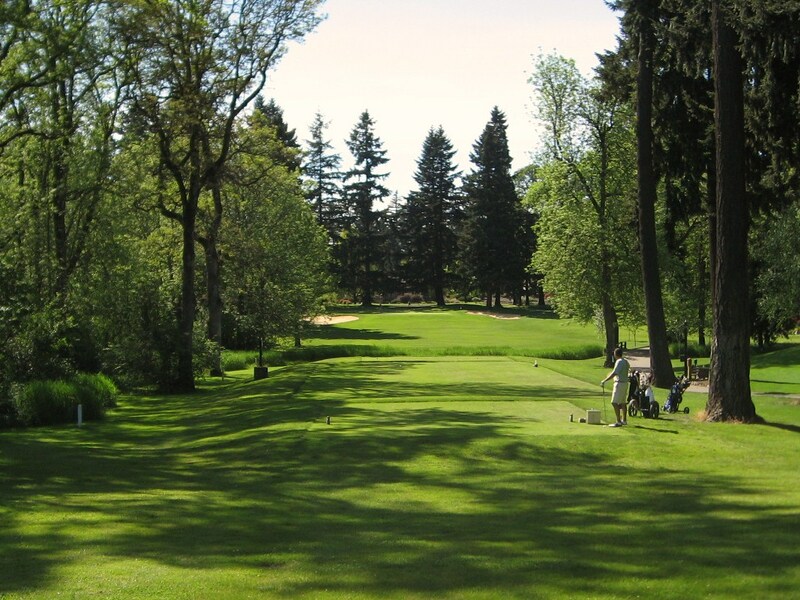 Like #10, the two shot sixteenth brings a lot of old world charm to the course. However, instead of evoking an Irish links, the train tracks running up the right side of the hole are reminiscent of quite a few courses in Scotland. A long waste area runs up the right for most of the hole and directs the tee shot to a wide fairway that stretches out to the left. The rumpled fairway complicates the approach but provides a great opportunity to bump and run using the slope to carry the ball safely onto the green. A miss right could be costly as the bunker well below the putting surface is the only thing protecting the golfer from a lost ball. The “infinity green” is a nice touch that appears to pull the Sound much closer to the field of play. Although the scenery is different, from the middle tees, the tee shot on number 17 is eerily similar to 15. On most days, a short iron played downhill to the left side of the green will suffice nicely as the bunkers in front should be avoided at all costs. The train tracks to the right can provide a distraction at certain times of the day, but for the most part they just add to the ambiance. 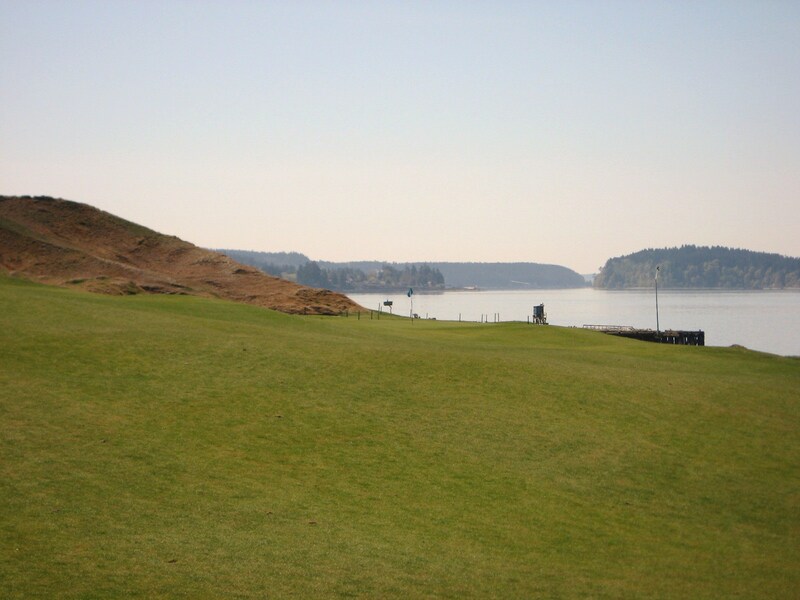 The home hole at Chambers Bay will provide a lot of excitement on tournament Sundays. 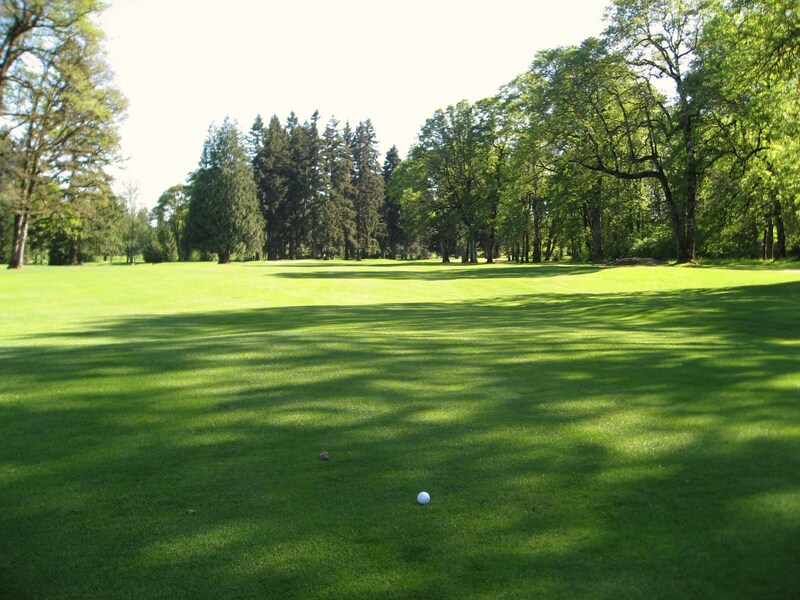 Tipped out at over 600 yards it is a long hole that gives the golfer plenty to think about. The waste area in front of the tee should never see a drive, but the two bunkers to the left will get plenty of action. With a tailwind a 3 Wood to the middle of the fairway might be the right play although a powerful drive down the right side or over the edge of the left bunker will be required to get home in two. The 18th from the tee at Chambers Bay. Photo by Rob Rigg. approach, although the friendly backboard can be used to get it close. This hole will yield a wide array of scores which is I am confident the architect had in mind when he designed it. The 18th hole from behind the green. Photo courtesy of Scott Weersing. Photos for personal use only. A round at Chambers Bay is the type of golf experience that will keep walking golfers from around North America coming back for more. 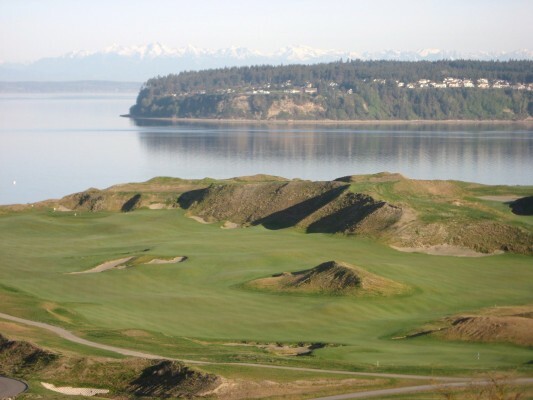 RTJ II, Jay Blasi and the team have done something very special in Pierce County, WA and The Walking Golfer would encourage all golfers to visit Chambers Bay and experience what it has to offer.